The NYC Department of Transportation announced that the one lane ramps on the FDR Drive leading to the Brooklyn Bridge have been widened to help east congestion. Another ramp at the Cadman Plaza exit on the Brooklyn side is scheduled to also be widened later this year. The larger ramps are part of the $508 million renovation of the Bridge, which began in 2010 and is expected to end next year. The project includes a complete paint job and repairs on all the approach ramps. DOT Commissioner Janette Sadik-Khan says, “New Yorkers can take pride knowing that the Brooklyn Bridge will serve as the premier inter-borough connection for another 130 years." 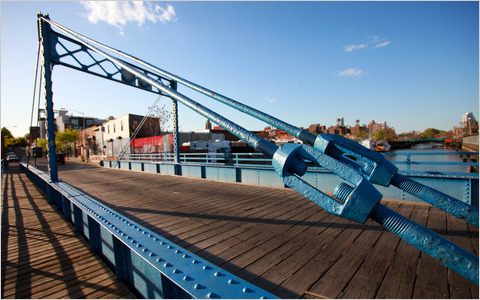 The 124-year-old Carroll Street Bridge, which connects Carroll Gardens to Park Slope is being repaired due to damage done by Hurricane Sandy, as well as old age. Workers have set the tiny bridge in the open position, where it will remain for approximately five months. Layers of the bridge's wooden planking have been stripped away, due to wood rot, and will be replaced. The cobblestones have been reset, and there are plans to update electrical systems and bring everything up to code.